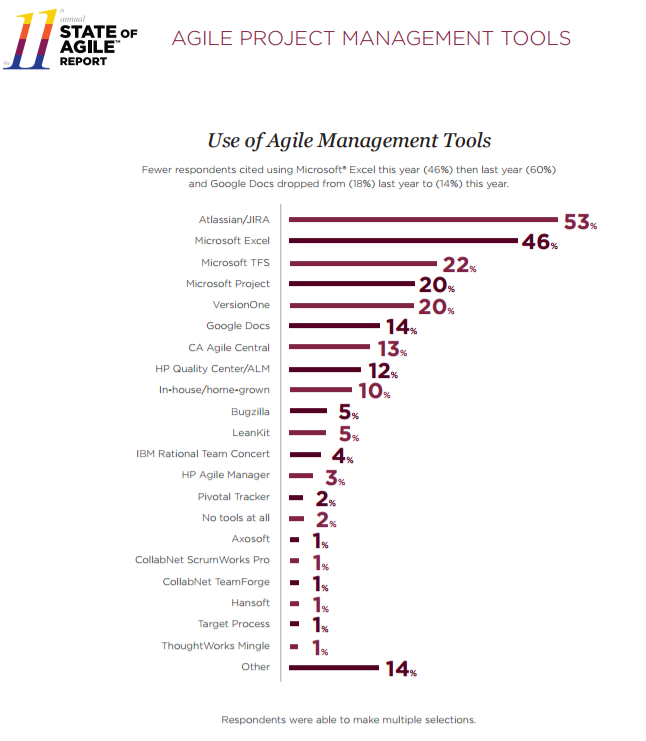 Two recent reports highlight the dominance of Atlassian in the Agile tools space. With north of 85,000 odd customers now, Atlassian’s Jira and associated products are both a leader in practice (Gartner) and a leader in market share (VersionOne). 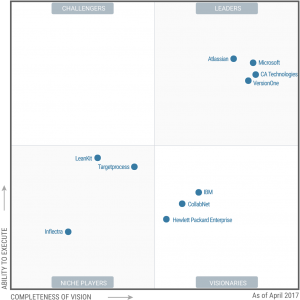 Whilst it may be that VersionOne is not as esteemed a research source as Gartner – we’re going to believe them since they are a competitor! What’s amazing is that VersionOne is calling out Atlassian as having over 50% of the market (actually we think this is low but who wants to quibble?). c) more thoughts on the VersionOne market research. The Gartner research operates on the basis that to qualify any Agile tools need to have in excess of $10M revenue, but then doesn’t use market size as a parameter. We don’t think that’s exactly how best to rate the players. What’s noticeable about this view is that it resonates logically. No doubt Gartner doesn’t want to offend its bigger clients and hence the Visionary category. Our view is that if you’re visionary with low market share – you are in fact legacy. We don’t feel that being a Visionary is better than being a Challenger so we rated Challengers higher in the ranking. For those that are Challengers with low market share, we have labelled them as Pretenders which we feel sums up nicely TFS and CA (Rally). 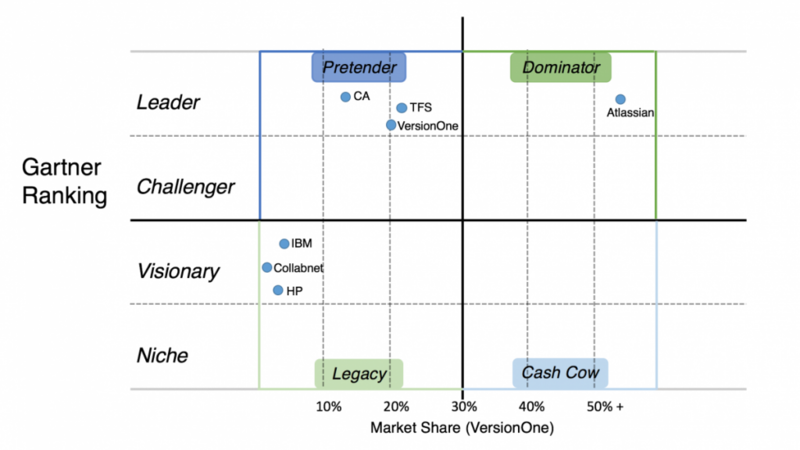 Any Visionary or Niche player that has a larger market share could be a cash cow – we don’t see any players in this category though based on the research. The one thing that of course stands out is the absolute dominance of Atlassian. It is so noticeable in fact it’s our view that it’s more important to understand how the Atlassian tools are used, rather than how many companies actually use them. It should also be noted that we believe that VersionOne is under-sizing the share of Atlassian, in this analysis, but who is to argue? Gartner has certainly recognized Atlassian’s leadership in this space and I realize that it’s always important to find something wrong as an analyst, but I wanted to speak out about some of the comments they make that are simply not correct. In fact being framework agnostic is a huge strength. Regarding supporting SAFe, that’s an unfair characterization. The Jira Portfolio module has a configurable hierarchy for just this purpose. Our team has already implemented SAFe and built this hierarchy. The real question is whether SAFe is the right answer – it’s certainly not the only one for enterprises. The very great strength of Jira is that it supports any flavour of scaling and planning. How about Lean? DAD? There are many approaches. Clear pricing is difficult to find on any of the leader’s pages. Atlassian spends most of its $ on making better products, not expensive account managers. As partners we like that – and many of our clients like that. This is a paradigm shift in the way that enterprise software is sold – Gartner just hasn’t grasped it. Yes, but this is not related to the scaled reporting aspects. And the simplified workflow scheme for agile projects – simply makes this statement wrong. This research shows that old habits die hard, with Excel still scoring highly alongside MS Project. In our previous analysis we have discounted the use of tools that are for convenience rather than by design. As per our previous comments we were surprised by the so called leaders such as CA or VersionOne having such small market share. There is a lot of choice here – some of these vendors are solely cloud based. However we believe that Atlassian has both Data Center, Cloud and on premise Server versions. Gartner likely factors this consideration into its assessment. We’d like to hear what you think. Contact us to review your Agile tools strategy.